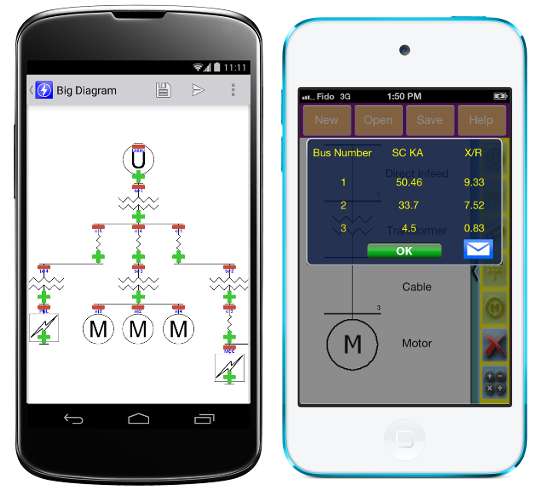 Short Circuit Analytic (SCA) software and mobile apps perform available short circuit fault current calculations in three-phase electric power systems you are working with. The programs take into consideration all of the key electrical parameters of power distribution system including power supply, cables, transformers, motors and generators. Short Circuit Analytic software and mobile apps ensure accurate results by performing comprehensive short circuit analysis and taking into account both active and reactive parts of equipment impedance. NOTE: Number of child elements for each parent element has been limited to one (1) only in free unregistered version of the program. Short Circuit Analytic program is now available by mail in disk format or via download from our web server. Payments can be made online using Visa or MasterCard credit card, through PayPal or any other acceptable payment form. The installation package and the individual product registration credentials will be sent to you within 24 hours of placing your order. We offer money-saving bundles of programs. If you bundle Short Circuit Analytic (SCA V1.0) program with ARCAD AFA V5.0 arc flash software you will pay less than purchasing the programs separately. SCA mobile can be downloaded, installed and used for free. The free SCA mobile for iOS operated systems is limited to 208V systems only. Number of child elements for each parent element has been limited to one (1) only in free version of the SCA mobile for Androids. There's an optional in-app 'Pro Upgrade' purchase available for $79.99. The upgrade will remove the above mentioned limitations. Make sure the input screen is active. The input screen is the screen with the one line diagram of the system. On the input screen, right clicking on any element will bring up a dialog box for that element. When an element is connected, it is placed in parallel with all other child elements of the element selected. An element may also be added by clicking on the button in the palette bar that corresponds to the element to be added. Make sure the input screen is active. The input screen is the screen with the one line diagram of the system. An element can be deleted by clicking on it once to highlight it and then selecting Delete from the Operations -> Selected Item menu. It can also be deleted by right-clicking on it and selecting Delete, or highlighting it and then pressing the Delete button on the toolbar. Click on the File menu and then select Open menu item or press the File Open button on the toolbar. A dialog box will appear which lists all the short-circuit (*.sca) files in the active directory. One of these can be selected or the directory/drive can be changed to list other available short-circuit-analytic (*.sca) files. To print a single-line diagram, select Print from File menu or press the Print button on the toolbar. You can adjust printing options and preview the output by clicking on Print Setup and Print Preview buttons on the toolbar. All the data for a system can be saved by clicking on File menu and then selecting Save or Save As menu items, or pressing Save button on the toolbar. Files for single-line diagrams are saved with the *.sca file extension by default. Simple point-to-point short circuit fault current calculations are carried out using Ohm's law and equipment resistance values. To determine fault current at various locations within power system, the system characteristics such as available short circuit value at service entrance, line voltage, transformer KVA rating and percent impedance, conductor characteristics are utilized. The calculations become more complicated when resistance values are replaced with an impedance values. For instance, transformer ratio of reactance to resistance (X/R) is used along with transformer percent impedance to determine X and R values on a per unit bases. Similarly, the impedance for conductors within the electrical system are also broken down into X and R components of the impedance. The peak asymmetric fault current is also determined by X/R ratio. The total asymmetric current is a measure of the total DC component and the symmetrical component. The asymmetrical component decays with time and will cause the first cycle of a fault current to be larger in magnitude than the steady-state fault current. Also, the decay of the DC component depends on the X/R ratio of the circuit between the source and the fault. Knowing the fault X/R ratio is essential when selecting electrical and protection equipment. For example, all low-voltage protective devices are tested at predetermined X/R ratios. If the calculated X/R ratio at any given point in the electrical distribution system exceeds the tested X/R ratio of the overcurrent protective device, alternate gear with adequate X/R rating should be considered or the device effective rating must be reduced. Furthermore, electrical motors are contributing short circuit current back into the system during a fault condition. The total motor contribution depends on factors such as motor FLA, voltage, the reactance of the systems at the point of the fault and the reactance of the motor. If there is no Microsoft .NET framework installed on your system, or the installed .NET framework version is less than 3.5, please follow the Download .NET Framework Version 3.5 link to update your system. Should you encounter any problem installing or running SCA V1.0, contact us and we will assist you in identifying and resolving the problem.